If you are looking to completely manage and process your payroll in-house, then choose our GrandMaster Suite or GrandMaster II desktop software solutions. From basic payrolls to complex payroll and HR requirements, GrandMaster software can be customized to meet the exact needs of your business. These powerful tools enhance your ability to plan and to organize all of your company's personnel requirements. Improve your business workflow while at the same time providing superior service to your employees. Read below to see which tool is the best fit for your organization. GrandMaster Suite integrates Payroll, Human Resource, Employee Scheduling, Time Keeping and Electronic Funds Transfer modules into a powerful multi-user management tool. 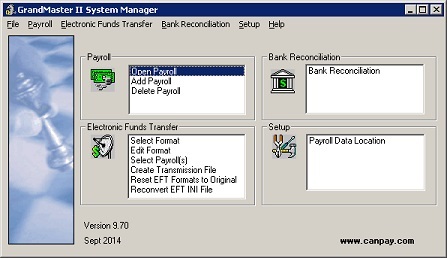 Use the Payroll module on its own to effectively manage all aspects of payroll in your organization. Or add the other powerful modules to take advantage of the full power of the integrated suite. The suite is designed to accommodate basic payrolls while offering larger organizations the flexibility to handle complex payroll and HR situations across multiple departments, companies and locations. Each module includes useful features that can easily handle the most complex requirements. Use the features you need today knowing that if you need more functionality tomorrow, it's already there. If your organization processes payrolls for 20 employees or less, GrandMaster Suite is yours to use, Free of Charge. That's right - the latest, full-functioning version is yours to use with no time limit restrictions or ads! Click Here for more details and to download the number one Canadian payroll software for free. Click Here for more details about this powerful desktop-based software solution. GrandMaster II is a simple yet powerful software solution for Canadian businesses with basic payroll requirements. The program includes Payroll, Job Costing, Electronic Funds Transfer (EFT), and Bank Reconciliation modules. The program also provides comprehensive reporting functions and allows you to Import/Export program data so you can easily interface your payroll to and from spreadsheets, electronic time clocks, human resource systems and other accounting systems. Click Here to view more details about this flexible desktop-based software solution. GrandMaster Payroll software for Canada businesses.